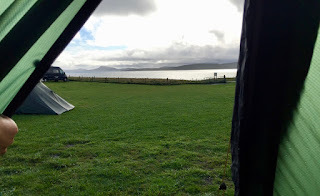 I woke to a hot tent, sunshine, and rain. 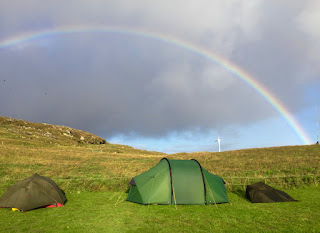 It was Katie’s turn to have sneaked out early, not for a swim but to photograph the huge rainbow straddling our camp, and only to discover that I’d left her camera’s memory card in the reader last night, thereby causing her to miss the best moment. Whoops. It’d been a later night than we’d expected. 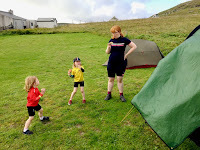 Having paid for a campsite and not knowing where my next opportunity for ablutions would arise, I for one had taken the opportunity to have a shower after finishing culinary duties in the ‘dining shed’ (very handy indeed - every campsite should have one). Possibly more importantly, I was able to rinse out my utterly minging socks. I’m not sure how I’ve done it but I only have two pairs with me, and one of those is the ‘I’ll take them just in case’ spare pair I grabbed from the car’s door bin as I was about to leave Oban. Flippin’ good job I did, because even with two pairs, it’s going to get ‘interesting’. This is definitely not a place where I am going to find an M&S selling size 15 socks and mail order doesn’t quite cut it when you don’t know where you will live by the time a consignment reaches the islands. The unfortunate side-effect of a time-constrained tour, especially when you’re dependent on relatively infrequent ferries, time-limited border crossings, or a train to get you home, is that you end up with more intermediate ‘deadlines’ than you might like. They’re all self-imposed of course, the world won’t end if you don’t make it, but the prospect of making it to all the places you’re hoping to, is always set against the pleasures, or necessity in extremis, of staying where you are. 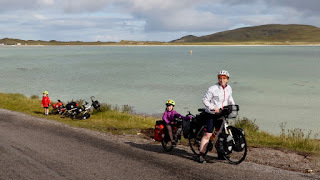 It’s especially hard to make that trade-off when you are entering new territory, which for us this time is North Uist, Berneray and Harris, in particular. For the more intrepid traveller, a good knowledge of the CalMac booklet’s contents is invaluable if you are to avoid an awkward call to your employer to break the news to them that the next ferry off the island is the day after you were due back at your desk in the city. As a result, the equation of ‘waiting for the tent to dry’ vs ‘losing minutes off our margin for making the ferry to Eriskay’ was particularly finely balanced this morning, and having bade a final farewell to Clem, Steff and a notably disappointed Noel, our almost-dry tent was shovelled into the panniers so fast we hardly noticed the midges, and we dashed off for the 1110 Eriskay ferry, my still-damp socks installed under the legs of my bibshorts; a hint of steam emanating from their new thigh-powered drying system. The road from Eoligarry past the airport became a heavyweight time trial course, and we knew we were missing some beautiful beaches just out of sight to our right as we went haring over the lumpy, sandy road. 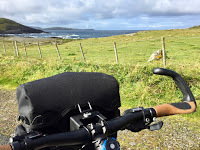 At the end of a long, draughty straight back to Traigh Mór, I made the mistake of stopping to wait for Katie within sight of the baggage handling facility, and nearly had a mutiny on my hands when Rhoda, and then Ruth, wanted another ride through it. Back towards the junction with the island’s ‘ring road’ and we found ourselves on familiar tarmac, alas with little time to stop and take in the stunning view of the beach we’d sat and drunk in last time we were here. We attacked a couple of sharp little rises, which we remembered slogging up with the trailer pushed on foot by Thomas Ivor, and it became apparent that if we were going to make it, it would be very tight. 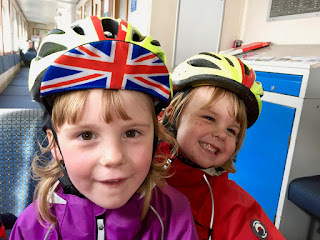 Frustrated by seeing a lorry, which I knew would make the ferry comfortably, turn across our path, whilst possibly leaving us to watch it depart, I decided to go on a solo break (well, Rhoda and me) in the hope of ensuring they hung on for Katie and Ruth’s arrival. Cresting the last rise before the slip, a little bit anaerobic, sock-steamer on full blast, and wondering where I put my Ventolin, I saw the MV Loch Alainn, which looks broadly similar from both ends, some distance from land. Relieved by the realisation that I hadn’t seen the tell-tale line of cars coming the other way, I rolled to the terminal, having, as it turned out, ‘spent my tokens’ for nothing. As is often the case in the Hebrides, the ferries are the place where you bump into other wheeled travellers, often the same ones in different permutations, to swap tales of what’s happened on the road (and sympathise about the direction of the wind) since last you crossed paths. Some of the cyclists we had seen on the ferry to Castlebay were rather shocked by the solid progress we and the girls had made, as were an elderly couple with a motorhome, whose dog the girls had played with on the crossing from Oban. Presently, Katie and Ruth rolled in, showing similarly the effects of needless exertion. Ruth had been pushing especially hard to make the ferry, Mummy noted. Jelly babies and fist bumps all round. The Sound of Barra ferry is a pretty dour affair, for what is in fairness one of the shorter and more frequent crossings, where motorists can elect to remain in their vehicles. There’s an open car deck with a waiting room befitting a tired NHS hospital to the side; a small promenade extending along its roof for tourists and sunny days. 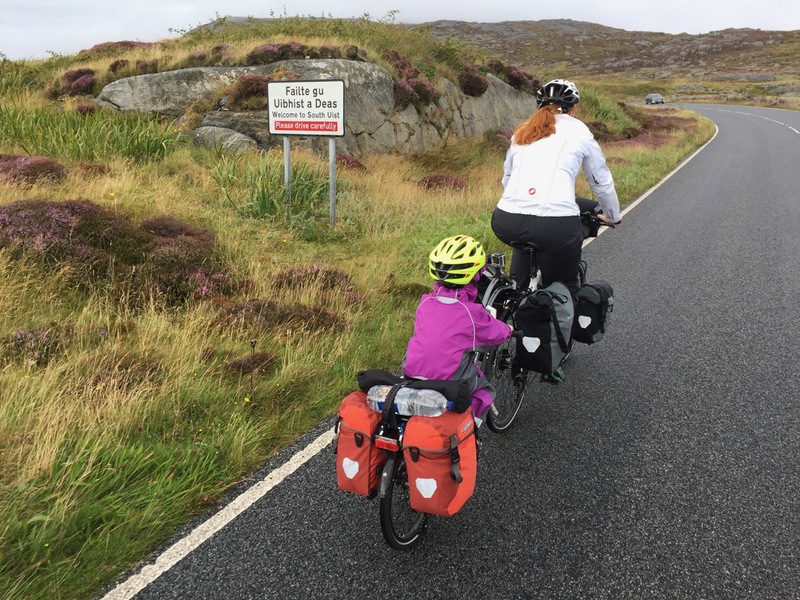 Unusually, it affords access to your bikes during the crossing, which is particularly handy for us and something we would be glad of more often! The chance to adjust things, oil chains, swap pannier contents around and set up cameras whilst making forward progress is to be seized with both hands. 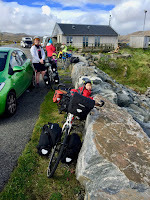 Readying ourselves to get off the boat, we were in the invidious position of knowing that we were about to tackle our nemesis from our last visit here - the short, sharp climb from the slip, over the hill to the village and the causeway to South Uist. We decided not to put on an ‘ambitious, but rubbish’ display of heroic failure for the other tourists, so as we usually do now, we waited for everyone else to hit the beach and get up the road before setting off. 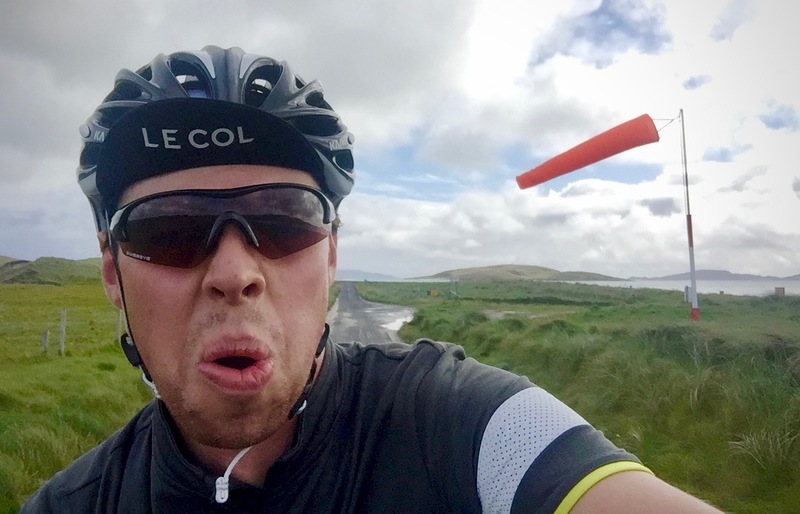 I’ve been in training for the last few weeks, attempting to ride 10% of Mark Beaumont’s mileage as he cycles round the world, and so am rather fitter than I was in 2014. 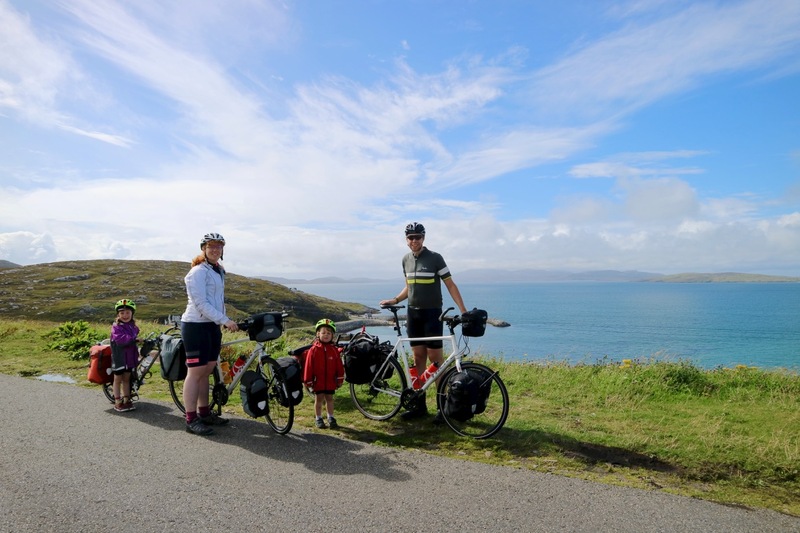 Mark climbed the steepest part of the climb, segmented on Strava, in 59 seconds, when he launched the Hebridean Way. 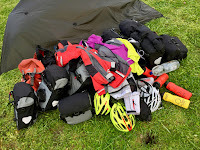 The new trailerbike, and its occupant, even accounting for luggage, are probably a shade lighter and definitely more stable than Thomas Ivor’s Mountain Train was, last time - but the gradient still kicks to 22%. In my book, that’s sick and wrong on any kind of bike - but especially when you are taking a bike and rider totalling near enough 200kg. I had been having nightmares about having to trudge up this one again ever since we chose this itinerary. One-in-five. Single track road. No way out. I stalled and had to walk last time; what Mark shrugged off in less than a minute took me six and a half of them, in an unedifying spectacle of grunting and straining. I wasn’t going home this time without having at least tried. Red mist mode engaged, and having already more than warmed the legs through on the approach, I was resigned to dropping Katie and meeting her at the viewpoint near the top of the climb with the camera already on the tripod ready for a picture. We’ve not had chance to swap Katie’s cassette yet and so she was running a slightly longer gear than me. 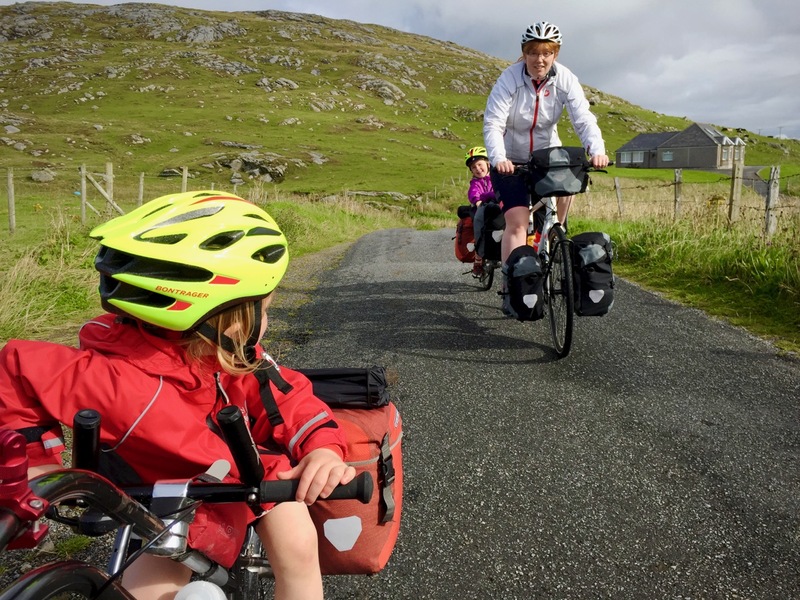 Without the benefit of training miles and with Ruth unlikely to be able to carry her own weight by the time the climb stiffened, it seemed likely that it would be a ‘Mummy walks, Ruth rides’ kind of climb, as we’d done on Vatersay. I laid into it as well as I might have, but ultimately, I’d have needed teeth on the rim of my wheel to have been geared to make it right up, in the seat, with Rhoda as dead weight on the back, and with my heart rate topping 160, only just able to unclip my feet, I had to admit defeat. Tell you what, though, it was close. I walked all of 50 yards, tops. That was as good as a win, in the circumstances - justification for another jelly baby, at least. 6 minutes 34 seconds in 2014; 2:36 this time. Mr Beaumont can hang on to his place on the leaderboard - for now! Looking back down the hill, Katie was indeed walking, and some way back, with Ruth twiddling away on the rear, but it turned out that this had happened sooner than she’d hoped, because the extra bottle of water we’d strapped to the lids of Ruth’s panniers had made a bid for freedom and rolled back down the hill. We swapped war stories, strapped the bottle down again, got the obligatory photograph (the sun being in as bad a place for this as last time, which is, I suppose, logical, since the island hasn't turned on its axis in the interim) and carried on, knowing we’d overcome a hurdle with less bother than we’d anticipated and keen to finish the day in similar style. 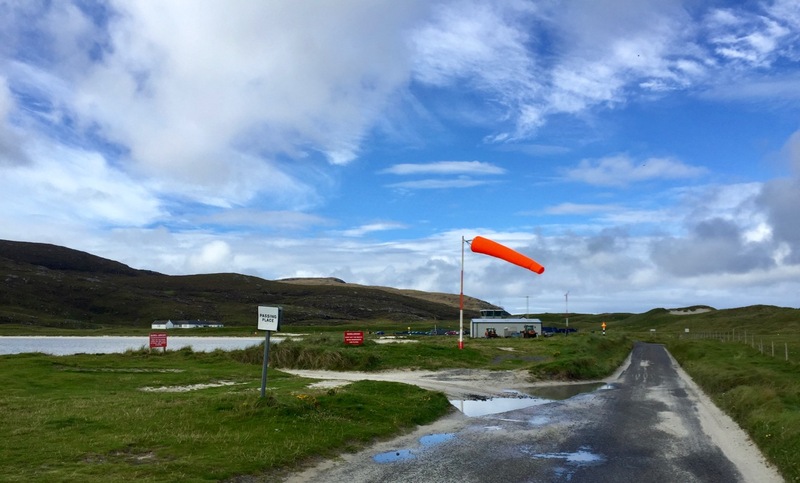 Last time we crested that hill, we rolled down the other side and shot through the village, straight over the island and stopped off at the beach by the South Uist causeway; this year, we had business to attend to in the Eriskay community shop, in the way of procuring lunch. We’d been hoping to get some cheap scallops from the seafood company on Barra, but our late departure had sadly killed that plan. We sat outside, eating an eclectic mix of short-dated and thus reduced-price items, until the rain suddenly pitched up, causing us to retreat to a nearby bus shelter to finish our yoghurts. 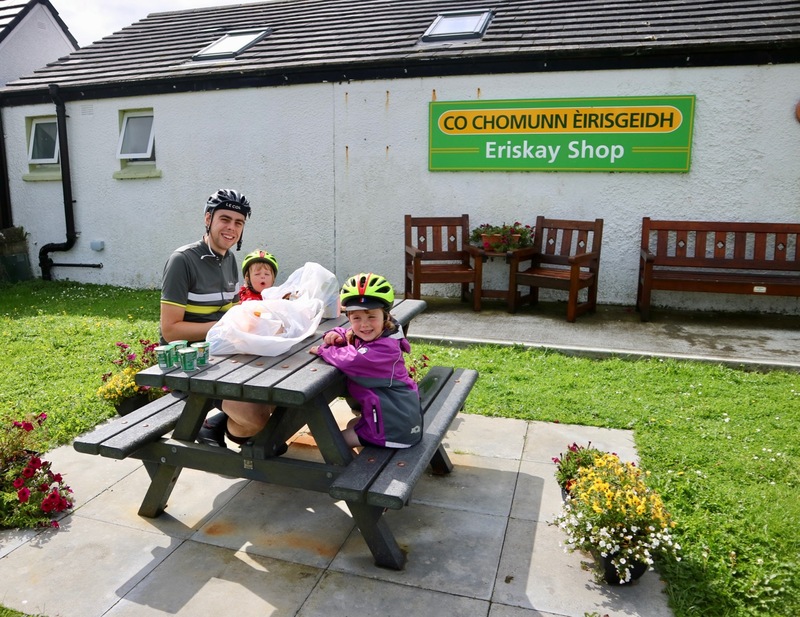 The cycle-tourist's dining room always comes to our rescue at least once per trip! “If you don’t like the weather, wait five minutes” is a common mantra up here, and sure enough, by the time we were ready to go and togged up in our waterproofs, the rain stopped and I was drowning inside my own trousers. Crossing the causeway onto South Uist, we arrived at the junction where the ‘Spine road’, which runs the length of the Uists and Benbecula, properly begins. Three years ago, this was the most soul-destroying piece of riding we’d done with the children. 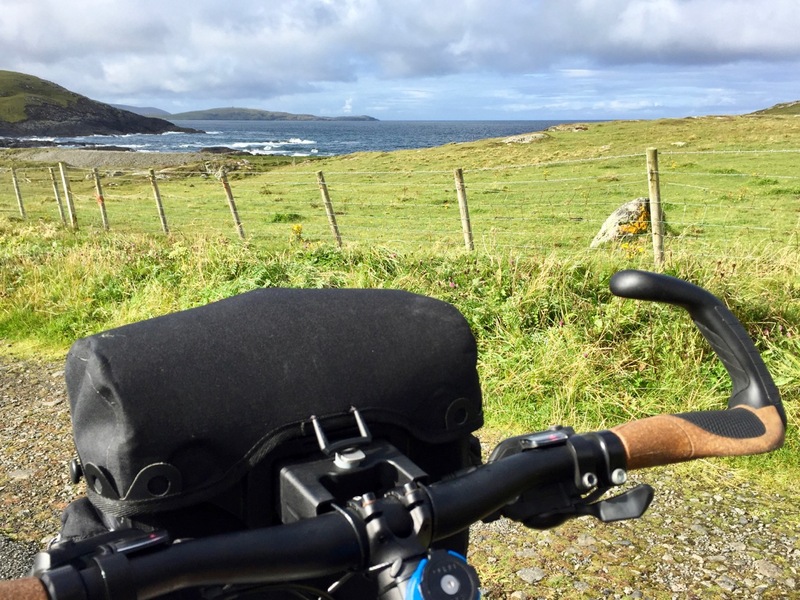 Everyone tells you to ride the Hebridean Way South-North, to account for the prevailing winds, but this means that if you meet with nice weather, there’s a good prospect of a headwind, because the prevailing wind brings the persisting rain. 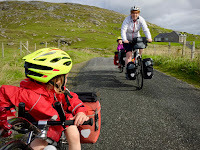 Pedalling to stand still is purgatory at the best of times but all the more so when you’re heading across open moorland on a straight road; after the beautiful beach trip on Eriskay, our only happy memory of South Uist was the moment a lady took pity on us and kindly let us pitch our tent in her garden as night was falling. It really had been a bit grim. 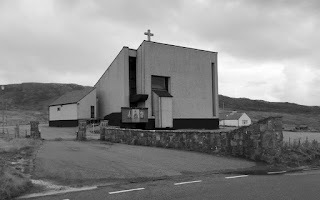 We got quite a shock, then, at the speed (nearly three times as fast) with which we climbed the first hill past the brutal form of the Catholic Church of Our Lady of Sorrows, and were quite unfazed by the periodically squally weather as the wind propelled us towards Daliburgh and our next Co-op. 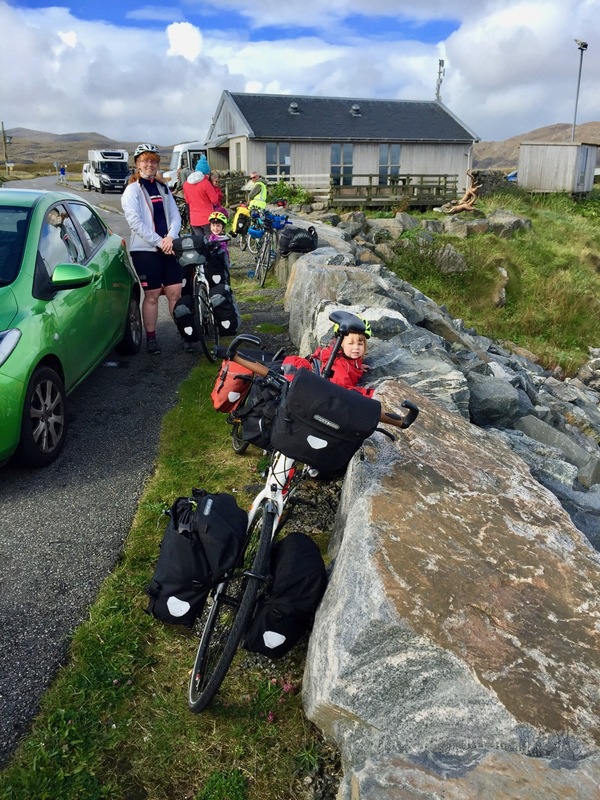 Castlebay - Eriskay - Daliburgh - Benbecula - Solas. The spine route is broken up, for us, into the gaps between Co-ops, and working out the resources we need to get from one to the next. They are our primary source of food, and of cash, a commodity one needs more often than we are accustomed to at home these days, in order to contribute to the economy elsewhere on the islands. Sure, there are a few other places to get food in between, notably the Fish, Chips and Petrol station just before Daliburgh, but a Co-op is an event. A moment to stop, take stock and obtain whatever supplies we’ll need before the next one. It’s like being on the M1 with a toddler and doing a ‘bladder audit’ on your prospects of reaching Toddington with dry seats, before you've left it too late to dive into Newport Pagnell. Frankly, the consequences of getting it wrong are just as catastrophic. Hell hath no fury like a junior touring cyclist who’s ridden all day and just been told you’ve run out of Stroopwafels. Coming up next - “I know, but is it socially acceptable to sleep in a graveyard’s car park?" oh i have enjoyed reading and laughing at this account and cant wait for the next intallment. 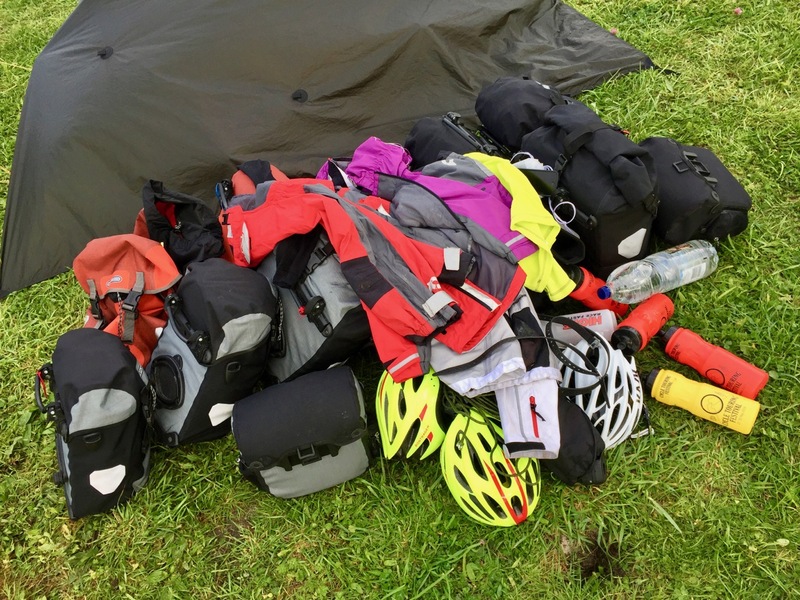 I love the term "cycle-tourists dining room" and i have to confess we have slept on the verge of a graveyard while up in the wilds of Scotland.